On September 19, 2012 AHC hosted our 19th Annual Charity Golf Tournament. The event was held at Bryan Park in Greens boro, NC. It was a beautiful day for golf and we raised $60,000 to benefit two charities. Joel Mills presented the first check in the amount of $30,000 to CaroMont Health for their Transitional Care Indigent Patient Fund. 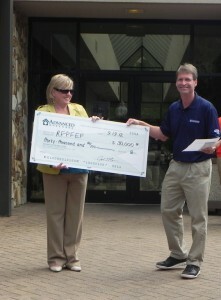 Judy Abernathy, Director of Case Management for CaroMont Health, proudly accepted the check. The fund will offer a home health visits for non home bound patients including a home assessment and medication reconciliation upon discharge from the hospital. “CaroMont Health, and the patients we serve, will benefit greatly from the generous donation from the Advanced Home Care Golf Charity Event. Our goal is to provide complex high risk patients with chronic diseases assistance to help manage their conditions and reduce emergency department visits and readmissions to the hospital”, Judy Abernathy. The second charity, the Rosemary Flanagan Patient Family Emergency Fund, received a check for $30,000, which was presented to Maria Thurlow, Advanced Home Care’s COO. “For over 15 years, Advanced Home Care has used the Rosemary Flanagan Patient & Family Emergency Fund to provide necessary and urgent support and to make a difference in the lives of the most vulnerable patients in the communities that we serve. The financial boost this fund will get from this gift will allow our social work teams to really make a significant impact in many, many lives!”, Maria Thurlow. The fund goes toward the purchase of supplies, utilities, and rent to help patients we serve. Thank you to all of our sponsors and volunteers for another successful tournament. 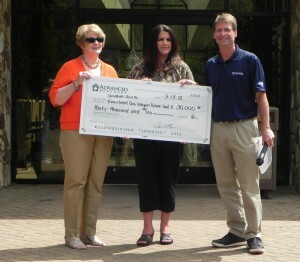 To see more pictures from the tournament visit Advanced Home Care’s Facebook page.